A simple way to brighten up your garage is to incorporate a few strands of LED Lights around the frame of your garage door. There are a number of different light styles available. However, LED lights usually last longer because they are more energy efficient. They typically have a blue-ish tint as well, and most LED lights can connect up to 25 strands. If you happen to live in a climate where it is sunny most of the time, then this may be the best option for you. These lights absorb energy and light from the sun during the day, and at night that same energy is used to keep the lights shining brightly in the dark. Like LED lights, solar powered lights are also energy efficient and environmentally friendly. Keep in mind the distance between the power source and the light strand so that you are able to plug in your lights if they are not wireless or solar powered. Once you have measured the distance and you are positive that the light strand will reach the outlet, check each of the bulbs to make sure they are working. Projecting lights on your home and garage does not require much setup or clean up time. Place the projector in front of your garage door and project a holiday scene, or even a holiday movie for your neighbors to see. Whether you set up outdoor lights or a projector this holiday season, an important tool to use is a timer so that you can conserve energy. Decorating the outside of your home and your garage may attract your neighbors this holiday. 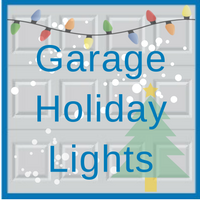 For other holiday garage design tips and ideas visit our Blue Sky Builders website or call 630-852-8485. Our experts have years of garage and building-related experience. We are here to help you with whatever your next project may be.